Cambodian Prime Minister Hun Sen called on both Cambodian and Chinese officials to be keen on promoting tourism and culture in 2019 to be more vibrant and vivid; and continue strengthening the cooperation between the two nations. The statement was made in a courtesy call from Luo Shugang, Minister of Culture and Tourism of the People’s Republic of China at the Peace Palace Phnom Penh on Wednesday. According to Eang Sophalleth, personal secretary to the premier, Luo’s visit to Cambodia is to announce the year of culture and tourism between China and Cambodia by organizing various activities in 2019. The official opening ceremony of Year of Culture and Tourism of China-Cambodia will be held this evening at Chaktomuk Hall, presided over by Luo and Cambodian ministers of culture and tourism. 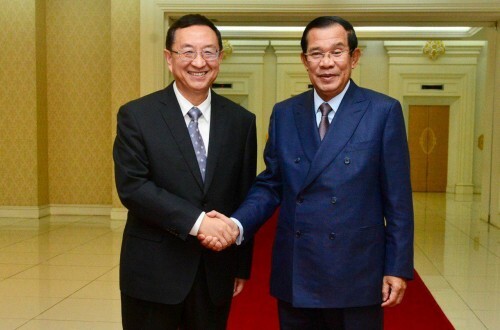 Luo also expressed his congratulations to the Premier Hun Sen for the fruitful official visit to China and stated that the separate meetings of Prime Minister Hun Sen with President Xi Jinping and and Premier Li Keqiang further enhanced the Sino-Khmer ties. In response, Prime Minister Hun Sen expressed his appreciation and gratitude to China for the preparations of the upcoming culture and tourism events, particularly for China’s long-standing support and great help. He added that tourism exchange between Cambodia and China will be one of the main engines to power Cambodia’s economic growth. According to Prime Minister, Cambodia welcomed 6.2 million international tourists in 2018; Chinese tourists accounted for 1.6 million compared to 1.4 million in 2017 with the expectations to increase to three million within the next few years. China-Cambodia relations are seeing more opportunities for greater development and progress. In 2018, bilateral trade between both nations reached over $6 billion, an increase of more than 20 percent compared with 2016.